Goal: Improve the quality of shared links from Push of Love. That’s pretty boring; it doesn’t provide me with any useful information about the content of the page and doesn’t make me want to click on it. It turns out we can make the link more compelling by adding some Open Graph metadata to the page. Now let’s apply this to Push of Love! Interesting! We already have a title and a logo. It turns out, if iMessage is unable to find an og:title it looks for the <title> tag on the page. 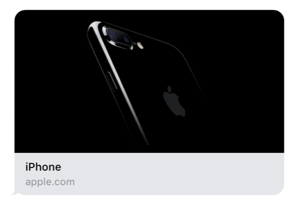 In addition, if iMessage is unable to find a og:image it looks for a logo and in this case it found our apple-touch-icon.png on the page. Nice, now we can see a large image of our logo when the link is shared! 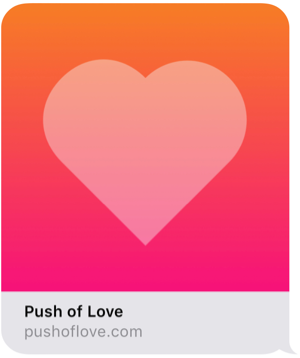 This is great for the homepage of Push of Love, but what about the pages for individual pushes? 💡 Idea! What if each “push” has it’s own image that demonstrates how it would look on your phone?! So, can we automate it?